If you’ve been following my blog, you might have seen that I’ve started using this wonderful editor called Coda for most of the development work I do. 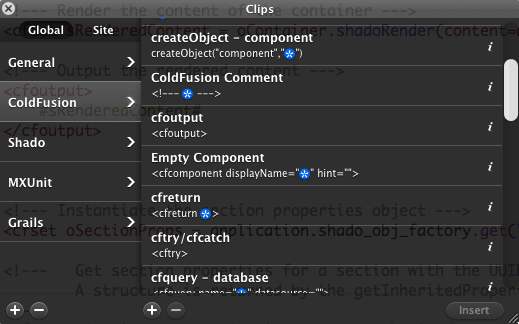 It has very nice built-in support for ColdFusion and given that it is a native Mac app, the interface is beautiful. And it has a few really nice features like built-in FTP and Clips (snippets). 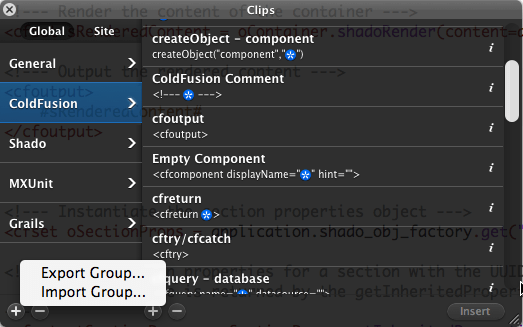 Over the last month or so, I’ve built up quite a few clips, which are just snippets in CFEclipse-speak, for ColdFusion, MXUnit and ShadoCMS. Obviously I’m adding more as I find time or as I need, but here is what I have managed to put together till now. Also, I’ve set up keyboard triggers for most of the clips. You might want to change them to what you like. PS: My initial ColdFusion clips started off with this comment on a previous blog entry. Thanks for pointing that out, Jules. I’ve fixed that. IIS was being silly… Not recognizing files of the type .clips. I’ve zipped them up now. Unzip the files and you should get the .clips file, which you can then import. these are great! I am coming from cfeclipse and had a snippet library there. This makes switching to coda much easier, thank you! One question though. Is it possible to highlight some text and then trigger a clip with a keyboard shortcut? It works for instance by selecting text and then clicking the clip to surround with comment but I am missing the command+shift+m commenting from cfeclipse. maybe there is a way to do it that I am not thinking of…..